According to Tantric Yoga, chakras are centers of spiritual energy located in particular places in the human body and associated with different kinds of feelings and perceptions. The way to tap into them is taught in both Hinduism and Tibetan Buddhism. In this 5x7 ink drawing I have used non-traditional colors and numbers of petals and have included only four of the seven chakras (from bottom to top: sexual energy, mental power [the solar plexus], compassion [the heart], and spiritual intuition [the "third eye"]). 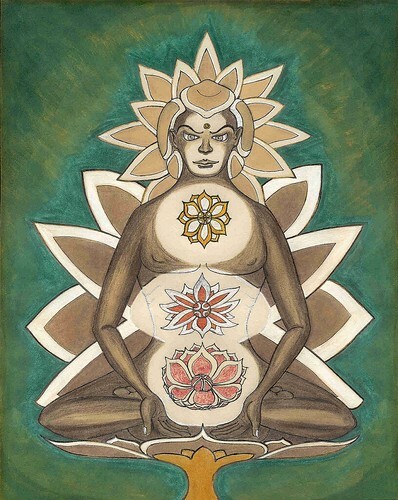 My drawing is not a map of the chakras but an illustration of the idea of the human body as the home of different kinds of spiritual energy which can be made to blossom under the right conditions.